ST. GEORGE — George, Streetfest on Main returns Sept. 4 with a country theme supporting mid-September’s Dixie Roundup and a Recovery Red Zone celebrating National Recovery Awareness Month. The increasingly popular “First Friday” monthly event happens on Main Street and in Ancestor Square downtown St. George from 6-10 p.m. with a fresh lineup of performers and street market vendors. The free Precision Hearing Main Street Concert will feature Southern Utah band The Whiskey Tooth Revival and singer/songwriter Lyndy Butler. Headlining from 9-10 p.m. is Courtney Marie Andrews of Seattle. Described as an artist with country roots, Andrews is a storyteller at heart and is known for her sound reminiscent of Appalachian and Rocky Mountain folk and country music. 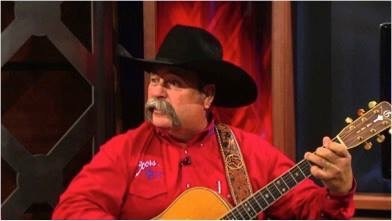 At the Zion Brewing Company Jazz Garden, fans of jazz and cowboy music will have a unique opportunity to hear Cowboy Singer and Storyteller Ed Montana of Amarillo, Texas. Montana will perform cowboy songs, stories and poetry beginning at 6:30 p.m. in the Courtyard at Ancestor Square. September is National Recovery Awareness Month, and in support of the local “My Name Is …” campaign, George Streetfest will create a Recovery Red Zone near Main Stage featuring booths by several local recovery agency and service organizations. A special edition “Red for Recovery” event T-shirt designed by local artists will be available for purchase along with red ribbons, wristbands and red lightbulbs. With temperatures expected in the 90s all week, misting stations will be placed on Main Street and Ancestor Square. Additionally, George spray bottles (personal misting systems) will be offered free by Stapley Pharmacy while supplies last. All night long, a culinary water bottle refill station will be available at Zion Park. Free shaded parking is available to event participants at the Main Street Plaza Parking Terrace. Enter at St. George Boulevard via Zions Bank parking lot. St. George City will continue to offer a two-for-one coupon for Carousel rides at Town Square, and the Italian restaurant Cappeletti’s and Judd’s Store on Tabernacle will remain open late to support the event. Carousel coupons are located on the Passport to the City and are available at the George Store Tent night of the event. 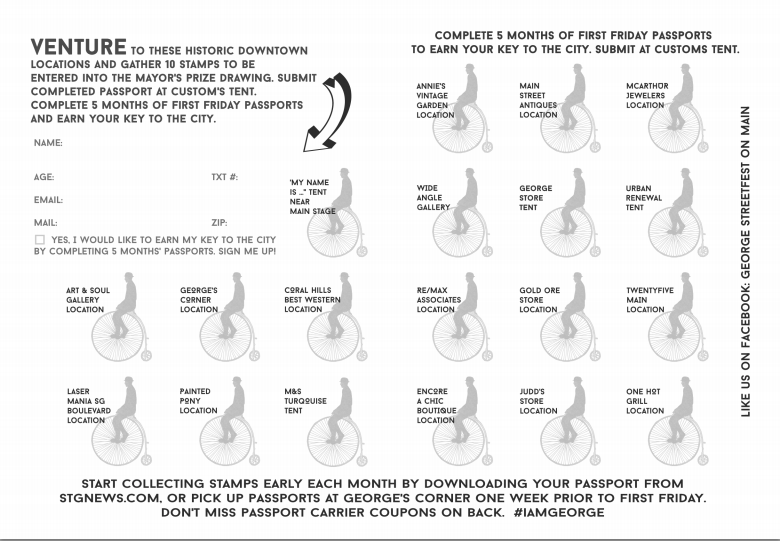 For those interested in starting early on passport stamping to qualify for the Mayor’s Prize Drawing, St. George News offers a downloadable PDF one week prior to the event. Tickets to the Dixie Roundup rodeo and gift certificates to Historical Downtown St. George restaurants are among prize giveaways in September. Created and presented by Melynda Thorpe of Emceesquare Media & Events, George, Streetfest on Main is quickly becoming a favorite event in Southern Utah, attracting locals as well as tourists from Las Vegas and the Wasatch Front. Event partners are St. George City, St. George Area Convention and Visitors Bureau and Historic Downtown Merchants. Additional sponsors are Canyon Media, St. George News, Etched Magazine, The Independent, Richens Eye Center, Zion Brewing Company, Simister Orthodontics, Precision Hearing, Wingate by Windham Hotel and the Habitat for Humanity Restore. Local artists and/or performers interested in applying for the Supporting Artists with Vision event scholarship by Richens Eye Center should call 435-773-0781. The scholarship offers street accommodations, including tent and vendor fee, for two artists each month wishing to promote their work. For more information, or to apply to be a street vendor for the Oct. 2 event, visit the Streetfest website. Vendor deadline is two weeks before each first Friday event. For sponsorship opportunities, contact Melynda Thorpe by email. When: Friday, Sept. 4, from 6-10 p.m.